I am a passionate rider and sponsored racer for well over 10 years. 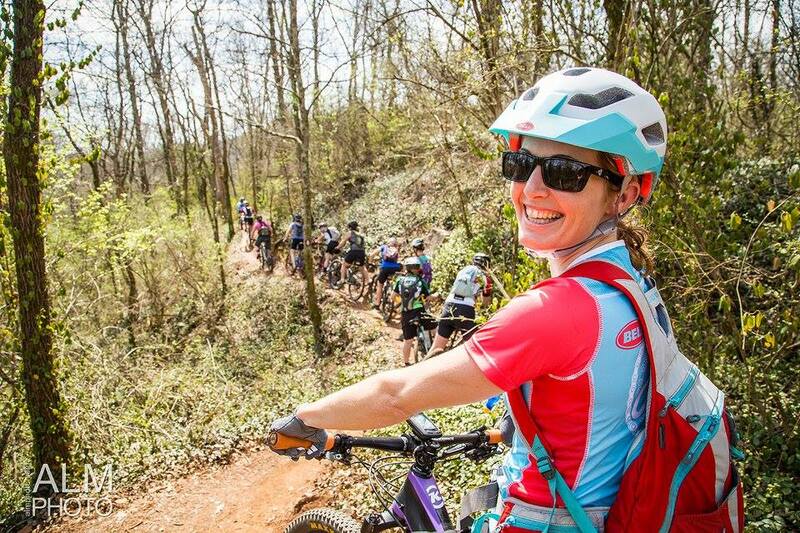 I am a women's mountain biking advocate promoting the love of cycling by supporting and encouraging no-drop rides dedicated solely to the female rider by helping to lead women-only rides in Knoxville, Tennessee. The mountain biking community in Knoxville — my family — has grown into an amazing and energetic group of people. It’s all about hard work, good fun, and at the end of the day, a great place to ride and live. I love riding a mountain bike and being a part of such an incredibly connected community/family, so why not share that joy with others and perhaps turn that someone into a passionate, lifelong rider and advocate? For over a year now, I’ve enjoyed being one of the original eight selected Joy Ride ambassadors for the new grassroots Bell Joy Ride Program that was developed to get more women into mountain biking. The company was inspired to try to build the most comprehensive map that will connect existing women’s riding groups in America. Bell welcomes all women’s groups that want to be listed on the map and encourages their participation to be included. 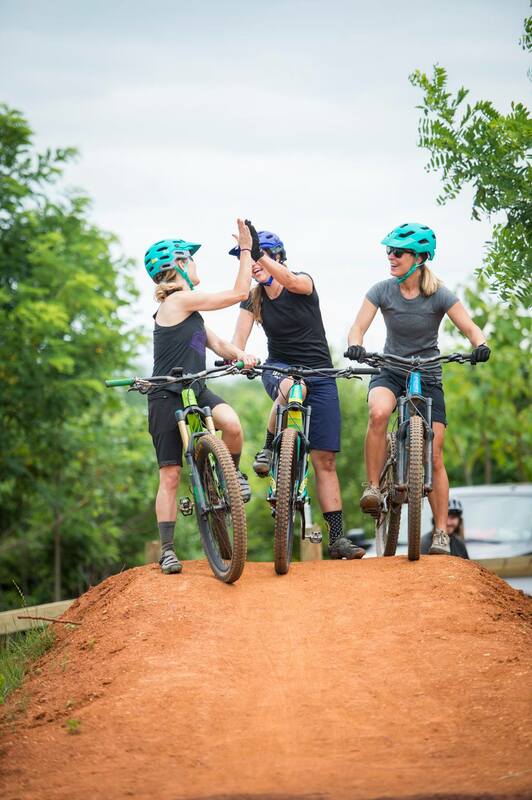 Now in its second year, the Bell Joy Ride Program is designed to inspire and enable female mountain bikers with regular, structured, fun and social rides that appeal to all levels of riders. I, along with many awesome women in Knoxville, have created a space where female riders (as many as 50-100 per Joy Ride) can enjoy both challenge and camaraderie in a non-race oriented environment. Bell Joy Ride is an informal women's mountain biking group. It's not a club or a team. There is no membership fee or initiation. You don't have to join or commit to anything. Ladies just show up! I host rides organized by rider level/ability. Beginners to advanced and everyone in between can join. I offer opportunities to connect with other female riders in a casual, friendly environment. Our goal is to have fun! 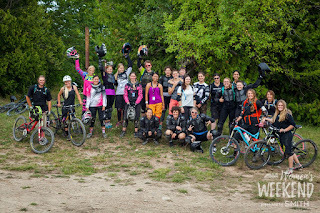 I love being a part of women inspiring other women to ride and progress in mountain biking by providing rides and resources that are supportive, social, fun and confidence building. As a Joy Ride Ambassador my goal is to help women (young and old) realize their potential through cycling. I aim to create a community that empowers girls and women through the sport, emphasizes the importance of goal setting, promotes healthy life styles, and recognizes the positive effects of strong female bonds. While this program is centered around creating camaraderie for women on bikes, it is most importantly about having fun in a constructive environment. Biking for me began when I was a kid and my dad pushed me off down a dirt road without my training wheels. That was it. I was hooked. Biking fell to the way side once I became the biggest nerd in college, but kicked up again for me once I started working on my graduate degree at Virginia Tech and joined their cycling team. I was always very independent and determined. The bike provided a freedom for me that nothing else ever has. I find solace, peace and even healing on the bike when I need it and biking has always brought me joy and contentment in the deepest sense even after long hours/days of suffering on the bike. What was your motivation to be a women's mountain biking advocate? Mountain biking is not easy. It can be intimidating, challenging and downright hard. When I started mountain biking in the mountains of southwest Virginia 10 years ago, the sport was not as accessible as it is today. Had it not been for other women riding and inspiring me to keep believing in myself, that I could ride a mountain bike, well I probably would have given up. Nothing has ever inspired or motivated me more to progress, ride, and race mountain bikes than meeting and riding with other women in the sport. Mountain biking empowers me and enhances my life now in such a positive way that I want to share that feeling by being an advocate for women to ride mountain bikes with other women in a non-intimidating environment. It is my time to give back. What has been your favorite event you've participated in and why do you enjoy participating at events? I have so many favorites: Shenandoah 100; BC Bike Race; The Icycle; Pisgah Enduro; Coldwater Enduro; Pisgah Monster Cross; Three Peaks. My favorite events tend to be the ones that challenge me the most both physically and mentally. After racing endurance mountain bike events for a few years, I decided to try something new. I’ve been racing Enduro events for the past couple of years because technical downhills are my weakness. I’ve always enjoyed a new challenge and how empowering it can be to tackle tricky technical sections during a race…maybe sections that I might not ride if not for doing them in the heat of the race! Mountain biking allows me to push the limits within myself and break through boundaries that for me can just be my mind telling me that I can’t. Do you have suggestions for those who have never participated at an event? You can’t fail if you don’t try! ☺ Have a friend sign up with you and when you show up, let others know that it is your first event! You will be amazed how many kind people at events will take you under their wing and help you with pointers! Be as prepared and as focused as you can possibly be for that particular event. What I realized was that by doing an event regardless of my results, I found myself riding features and technical sections of trails that I would have never ridden before if I hadn’t been “racing”. For me, a race is about how I progressed that day. Did I try something new?? If I can answer “yes” to that question after an event…then it was a success, a win for me. But, most importantly…have FUN! You will always win first in FUN if you are smiling and remaining positive no matter what happens on race day. Things will happen on race day that are out of your control, but stay focused and smile even if you don’t finish. Just be proud that you started! Yes. Some trail called Hair Ball at Pandapas Pond in Blacksburg, Virginia, with my friends Laura, Chris and Russell. They were all waiting on me at the bottom and laughing because I rode down the entire thing. Probably only because I was too trail dumb to be scared! It was exhilarating. Then I realized that I had a lot to learn! I fell HARD for mountain biking. I loved the challenge of learning how to change and adapt to dynamic terrain and overcoming obstacles that seemed impossible at first! The focus required for mountain biking also quiets my ever-racing mind. I love the calmness and stillness that I get inside while riding. Nothing compares. Smiling helps. A lot! Also, telling myself that I can instead of I can’t…always helps. Maintaining positive thoughts and focusing on staying loose and having fun really helps. I tend to get stiff when I’m nervous and have to remind myself to stay loose! Remember that you are on your bike and riding dirt…focus on having fun! Clips or flats? What do you enjoy and why? Clips for me most of the time, but I think that if you practice you can ride either and accomplish any skill or maneuver. I do ride flats on my dirt jumper since I’m it’s easier to throw a foot out more easily if I need to. I enjoy clips more because I learned how to road bike race and mountain bike race initially with clips, not flats. I think that I would like to try flats some over this winter just to see if it might help me to progress with maneuvers such as wheelies/manuals. Lots of crashes, road and dirt. Concussions, lots of stitches/staples, thumb ligament surgery, sprained ankles, shoulder separations, numerous bruises, scrapes, abrasions. I typically clean abrasions and ice the injury as soon as possible. The one constant in my life is biking, so mentally I am always determined to get back to pedaling as soon as physically possible. The sooner the better for my spirit! I get down and blue when I can’t mountain bike, so I do what I can do get back on the bike as soon as I can. I’ve realized that nothing one does in life comes without pain. That is the beauty of life… Pushing myself to go “full stoke” requires dedication and practice in order to ride a technically challenging feature. I think I’m learning where my limits are with mountain biking and just how far I’m willing to push myself. I’ve definitely toned down how “big” I’m willing to go on certain trails and features. And, I’m ok if I decide that I’m not going to ride *full stoke* that day. Mountain biking for me is about progression and mastering a skill on a feature that has smaller consequences before taking it to a feature that has bigger consequences. In time and with practice, your confidence will continue to soar! Steep, off-camber ridge with ruts would cause me to freeze with fear. I learned that braking too much only caused me to freak out more and fall more. Proper braking technique is crucial for maintaining control of your bike and also for building confidence. Sometimes just letting go and not braking as much or as hard will allow your bike to flow through technical terrain. Also, sometimes you need to use your feet and legs to pump your bike while using your arms to help maneuver and not just apply the death grip to go down while hoping for the best. When I’m loose and using proper handling techniques, the fear turns into FUN! Don’t be afraid to take skills clinics by professionally certified mountain bike instructors. Good cornering skills were also essential to helping me gain more confidence. Learning to be more dynamic on my bike is still something that I constantly work on. For more technical features you may need to get comfortable getting out of the saddle. I think it is surprising to many, including myself, how aggressive you need to be on more challenging, technical terrain with your body positioning and maneuvering of your bike. Really steep, super rocky trails with big rock drops. I will stop and walk over tricky sections to scout the best line and then session those trail sections. If I ride through some or all, then I consider that a success. I don’t have to clean every technical section on a trail. I just don’t let that drag me down anymore. Learning to use my brakes effectively and not with a death grip allows my bike to flow over technical rocks easier with less bucking of the bike. If you are braking too much that tends to start a rippling effect of feeling out of control. When braking improperly or too hard, the more my bike’s suspension sags and I tend to get bucked more. I also wear more protective gear than I used to which helps me to gain more confidence on these types of trails. I practice the same technical trails over and over so that every time I go ride there, I see progress. That’s the beauty in riding the same technical trails over and over. If I start sessioning a feature and I can’t clean it in three attempts, then I acknowledge and move on. If I don’t then I just get tense and start feeling defeated. No point in that! I would also love to be able to have more confidence when jumping and clearing tables! What’s not to love?!! The freedom of losing myself completely in order to focus on nothing else but riding. There is no greater solace for me in life than riding my mountain bike. I also love the community that mountain biking provides to me. The people I ride with have become my family. I am never alone. Ibis Mojo HD3 size small (I’m short!). The HD3 features the famed dw-link suspension—bike is very fast going up. Geometry is longer, lower and slacker, with 6” of plush rear wheel travel—bike is scary fast going down! The lightweight carbon fiber frame design by Roxy Lo evens allows me to put a water bottle on top of the downtube! The 27.5 wheels are incredibly playful and the bike is SUPER fun on jump downhill trails and steep technical downhills. I cannot believe how well it climbs. I chose this bike because I switched to Enduro racing in 2015, so this has become my playful Enduro bike! Tell us about the Bell Joy Ride program- what was the motivation to apply? For a year now, I’ve enjoyed being one of the eight selected Joy Ride ambassadors for the new grassroots Bell Joy Ride Program that was developed to get more women into mountain biking. Now in its second year, the Bell Joy Ride Program is designed to inspire and enable female mountain bikers with regular, structured, fun and social rides that appeal to all levels of riders. I, with the help of many awesome women in Knoxville, have created a space where female riders (as many as 50-100 per Joy Ride) can enjoy both challenge and camaraderie in a non-race oriented environment. Bell Joy Ride is an informal women's mountain biking group. It's not a club or a team. There is no membership fee or initiation. You don't have to join or commit to anything. Ladies just show up! We host rides organized by rider level/ability. Beginners to advanced and everyone in between can join. We offer opportunities to connect with other female riders in a casual, friendly environment. Our goal is to have fun! 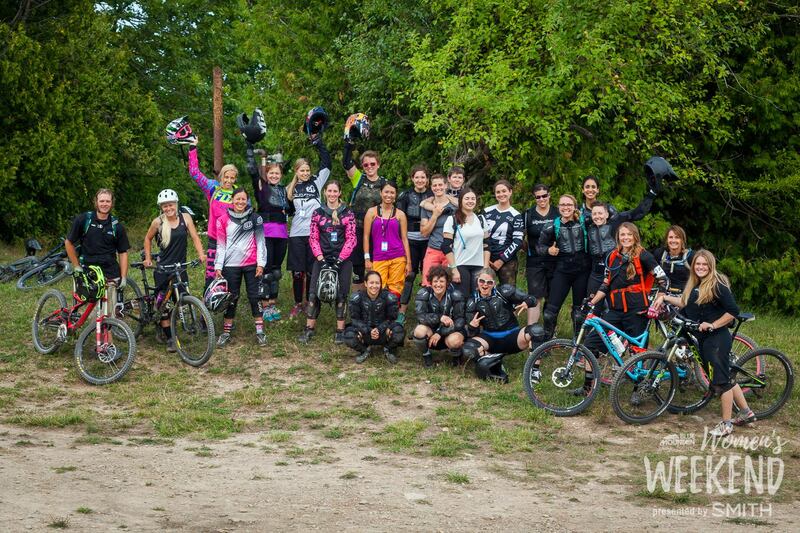 I love being a part of women inspiring other women to ride and progress in mountain biking by providing rides and resources that are supportive, social, fun and confidence building. As a Joy Ride Ambassador my goal is to help women (young and old) realize their potential through cycling. I aim to create a community that empowers girls and women through the sport, emphasizes the importance of goal setting, promotes healthy life styles, and recognizes the positive effects of strong female bonds. While this program is centered around creating camaraderie for women on bikes, it is most importantly about having fun in a constructive environment. Motivation: The Urban Wilderness initiative is unprecedented in my city, Knoxville, TN. The idea of taking isolated and often under-visited parks and connecting them with more than 100 miles of trail has created a synergy in Knoxville that has transformed it into a huge outdoor destination. At the core of that synergy are the nonprofits, Appalachian Mountain Bike Club (AMBC) and Legacy Parks. I have been an active member of AMBC since 2010 and attend the monthly meetings and join in the social rides and work days AMBC offers. They host some of the most consistent social gatherings in the city with their weekly rides, obtain large grants and land easements, and work tirelessly to build and maintain a huge portion of the trails that exist in Knoxville. They’ve taken public areas with once-seedy reputations like Sharps Ridge and built miles of recreational space, pumping life into parks, improving the quality of life for residents, and increasing the market potential for local businesses. Businesses, parks, people, and public image: they’re all connected, and the connectedness is set to continue spreading. I love riding a mountain bike and being a part of such an incredibly connected community/family, so why not share that joy with others and perhaps turn that someone into a passionate, lifelong rider and advocate? I see mounting evidence that mountain biking is gaining widespread acceptance as a valued activity that benefits recreation-minded people here in Knoxville and around the globe. Women mountain bikers have made tremendous strides but there is obviously more work ahead and my role as good Joy Ride Ambassador is to make sure that women are represented and our voices are heard by providing support and encouragement. It’s time for women to come off of the sidelines and feel the connection to Knoxville’s mountain bike community that I feel. I want to continue spreading the connectedness! I hope to inspire female mountain bikers with regular, structured, fun, and social rides that appeal to all levels of riders. Women inspiring other women to ride mountain bikes and progress is something I will never tire of seeing or being a part of. How has being part of the Bell Joy Ride program helped you with your group rides? Bell, modeling off the successful Girls Rock Santa Cruz program, provided me and the other ambassadors a ride checklist for success. The number one thing that was stressed was that women need an invite. Girls Rock Santa Cruz and Bell Joy Ride Programs were founded by Jessica Klodnicki (former VP of Bell Bike Helmets and now Camelbak). Girls Rock Santa Cruz was so successful because they would host a consistent ride every month and the women would be invited to each event. Over time, an email list of over 330 women opted in because they wanted to ride with other women. The events are totally unofficial, but super organized! I’m pretty good at organizing, but the Ride Success Checklist Bell provided initially really helps me to stay on track each month. The rides are consistent and once a month that everybody can count on and everyone will get an invite! Fun themes are good to keep the rides exciting too! So far the Bell Joy Ride Knoxville has an email list of over 230 women who have opted in to ride with other women!! *Begin planning for the next one! When it comes to applying for programs such as Bell Joy Ride, why should women apply even if they might not get chosen? Ladies! You don’t have to be chosen to be an official ambassador for a company in order to be an advocate for getting more women on mountain bikes. If you want to start your own local Joy Ride and call it that or whatever you want, then go for it! Just start small and watch it grow. Several of my friends have done just that: Lauren Breza in New Hampshire and Terri Watts in Athens, Georgia!! You ladies rock so hard!! The Successful Ride list above is a good start for a successful all women’s mtb ride. Try it and see what happens. You might just be amazed! It is all about connecting women to each other and connecting them to the local resources that are available to them and then maintaining those relationships! Do you have suggestions for those looking to start up women's rides in their area? Go to Facebook and “like” the Bell Joy Rides across the country including Knoxville, TN (https://www.bellhelmets.com/joy-ride-program) and follow what the ladies are doing in their areas with the Joy Ride programs. You can get some really cool ideas and be inspired at the same time. You can also follow the Successful Ride Checklist to get started. Start building and maintaining mutually beneficial relationships in your city with your local bike shops, breweries, wineries, REI’s, sports medicine doctors, local coffee shops, restaurants, your local mountain bike club, etc. Do you have suggestions how one can deal with the potential slow start that some women may face with getting more women involved with riding off-road? Try to get skill clinics to come to your area or close by and advertise to get more women to attend. Skill clinics can be incredible for confidence building, which is usually what is holding most women back from trying the sport. Also, work closely with your local bike shops to get demos for a ride/event for women. A bike that is set up for a rider can sometimes make a big difference. The local bike shops in Knoxville have all been incredibly supportive and have sponsored events as well as coming out to them to provide pre-ride bike checks and maintenance. Lastly, it helps to find a trail system that has at least one true beginner trail that is more accessible to new and beginner riders. Cost can be the biggest deterrent. Mountain bike technology is increasingly more advanced and with that comes increased cost! For me, I had to look at it as an investment in my health but mostly in my happiness. I have incredible life experiences because I’ve chosen to invest my money into a mountain bike. It may not be for everyone, so I suggest trying as many bikes as possible before deciding to invest your hard earned money into the sport. As well, mountain biking can be intimidating and I think that some women are really scared of getting hurt, or of not succeeding. In mountain biking, I’ve realized that you have to let go of negativity. I’ve accepted that I can fall and maybe I won’t ride a techy section clean every single time. But, if I’m positive and think my way through a technical section, then I can usually have a positive outcome. With the Joy Rides, the ladies get to ride in a group of women with the same skills thanks to all of the incredible women that volunteer to lead rides for me. It becomes less intimidating when you see other women riding a mountain bike on technical terrain. It gives you courage that maybe you didn’t have before. When women see how to get out of a scary/intimidating situation on the bike by thinking it through and staying positive, it translates into having more positive outcomes in life. Locally, I think Knoxville is kicking booty at getting more women to be involved. 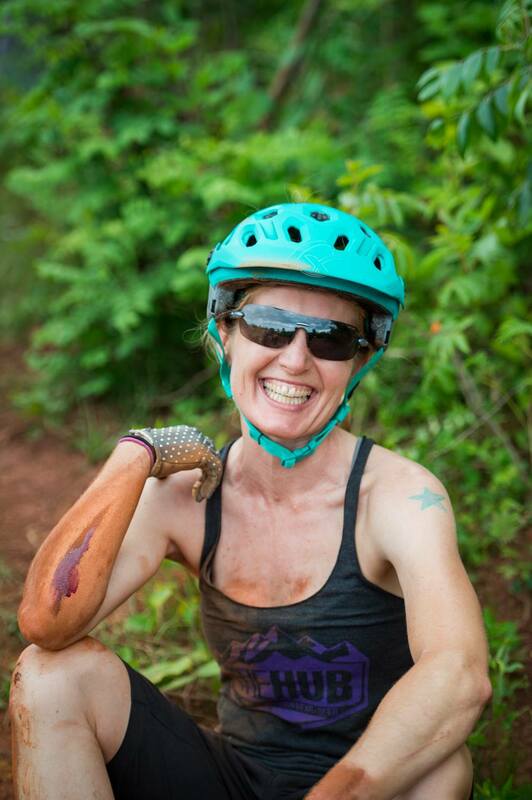 The scene of women mountain biking in Knoxville is soaring and the momentum continues to blow me away! The local bike shops are all willing to come out to local rides and events with demos and to offer bike checks, clinics, etc. The support is outstanding and I couldn’t be luckier for that! I think the mountain bike industry is slowing getting there. I feel that the cycling industry as a whole still has a ways to come in really welcoming women into the folds of cycling. Bell, Liv, Trek, and Juliana all have the right idea and are making huge strides, but when I walk into most bike shops, the presence of women employees is still astonishingly low. I think that getting more women to work in bike shops in order to provide a welcoming experience to women that visit bike shops is key to encouraging more women to be involved in the industry as a whole. Seeing eyes light up and smiles on faces when women try something new and they are successful. It’s the best feeling to see someone do something that they thought they would never even try. I am continually inspired by the women that are now going out and riding solo. I see this empowerment and I see it changing women’s lives for the better. Ladies are now friends and riding together…connected through the happiness that biking together provides. What could be better? southeast, especially in the mountains to learn more about fish, mussels and the environment they depend on. We too, depend on these freshwater environments to sustain us. After all…water is life. I also love to identify birds by their songs as I’m riding through the forests! Wheeeee! !